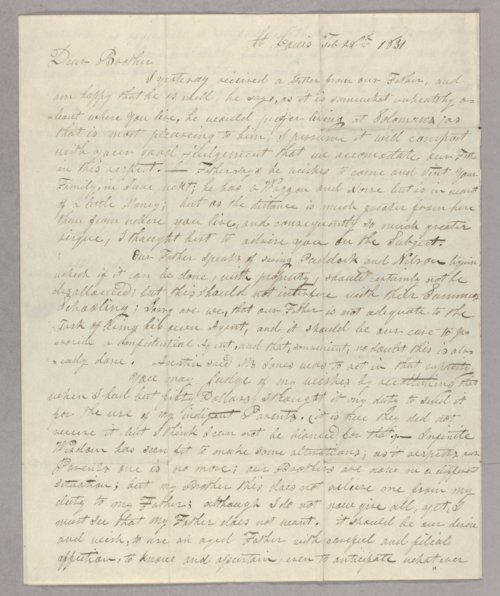 This letter is from Jedidiah Strong Smith (1799-1831) to his brother Ralph Smith (1794-1867) who was living in Wayne County, Plaine Township, Ohio at the time the letter was written from St. Louis, Missouri. The letter is written months prior to Jedidiah's death by Comanche Indians on the Santa Fe Trail near the Cimarron River. In the letter, Jedidiah writes about his travels, their Father and his anticipation of receiveing a letter from his family back home soon.